Bapco is a unique company, which has never stood still. The first to discover oil in the Arabian Peninsula in 1932, it started exporting in 1934 and refining in 1936. Since then, the company has helped shape the modern Kingdom of Bahrain, not simply through the generation of wealth, but through the development of Bahrain’s manpower. More than 80 years after the company’s establishment, new ambitions in exploration, and new initiatives in oil and gas field development and new global markets continue to open up with rapid advancement taking place in the company. 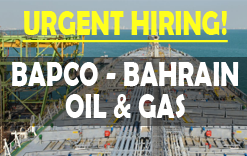 Wholly owned by the Government of Bahrain, Bapco is engaged in the oil ind​​​ustry including refining, distribution of petroleum products and natural gas, sales and exports of crude oil and refined products. Client interview will conduct soon. Experience in construction & installation (Equipment Accessories) in new refinery projects is preferred. Benefits are provided by as per Bahrain Labour law. Interested applicant can submit your resume along with all documents.